Even as Grizzly Bear has evolved from midnight whispers to gorgeous sonic panorama to exquisitely crafted chamber pop, the band has always been about finesse more than power. When performing at an art museum once, rather than admonish the crowd to “make some noise,” the members praised their audience for being so quietly attentive—the better to appreciate every last meticulous detail. Delicate beauty and refined presentation still rule on the Brooklyn mainstay’s fourth album, Shields, but the balance is subtly shifting. On 2009’s Veckatimest, and especially on signature single “Two Weeks,” the band made an important transition: from sketches to songs, from impressionism to realism, from ghosts to creatures. On Shields, the creatures are back, this time with teeth. “Sleeping Ute” blasts out of the gate guitars blazing, background noise clattering, as if singer-guitarist Daniel Rossen dug up some lost Led Zeppelin III outtake and repurposed it as his own. The stormy swirl culminates in one of the most satisfying guitar outbursts in this band’s career, a stutter-step riff caked in scuzzy distortion, before the music recedes into a familiar mannered swoon. Nothing after that hits quite so hard, but the mood is established: Shields is the most immediate, aggressive Grizzly Bear album to date. “Speak In Rounds” surges forward briskly; “A Simple Answer” rumbles along in a boom-bap waltz of sorts; closing numbers “Half Gate” and “Sun In Your Eyes” begin elegantly but build to tumultuous climaxes. The list goes on, but to prolong the comparison would undermine Grizzly Bear’s achievement here. Rossen and Ed Droste have developed such a powerful songwriting symbiosis that they sound like each other more than they reflect outside parties. Lyrically, Shields finds both songwriters fixated on matters of inclusion/exclusion and coming together/pulling apart, matching the music’s cataclysmic turns with tales of human beings colliding and ricocheting. The rhythm section of Chris Taylor and Chris Bear, a finely tuned partnership in its own right, does its part to stitch the dual songwriters into a singular vision. 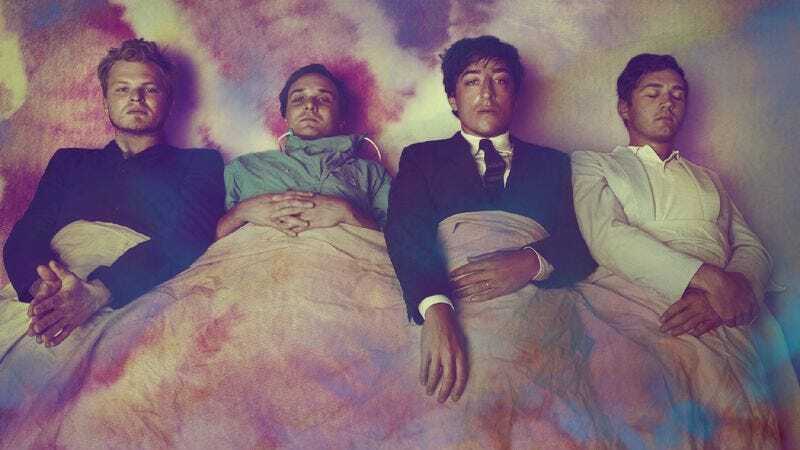 On an album that touches repeatedly on the barriers people build between each other, the members of Grizzly Bear have forged further ahead into sweet synchronicity.